This is the most challenging locations to photograph. I think I'm parking in an impromptu boat ramp for overnight fishermen. Several monster sized 4x4 trucks appointed with extra large headlights on top of the cab drove by during the evening, illuminating the trees, foreground, and probably the next city. I wanted to create a time lapse with the images, however this worked out well instead! This was the result of over two hours of exposures at f/4, 30s with a Nikon 16mm fisheye lens using the Nikon D3s interval timer. My iPhone has a compass, which is great to locate north - the center of the star trail. It's still too hot and rainy here, and I'm sure this will be better to try when it's cooler, but good practice in any case! If you like stars, this is the greatest site "Astronomy Picture of the Day". 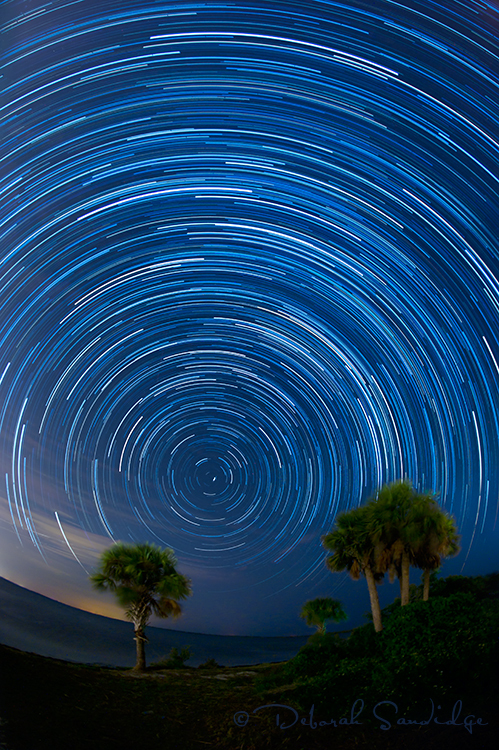 If you like to record star trails, please share your photos with me! I'd love to see them.